Greetings everyone! I videotaped this a couple of weeks ago and I want to humbly share this with you. It’s a short, 10 minute, video diary of my infirmity – the skin cancer that sent me to the operating room on May 31, 2013. I want to share it to encourage African-American males, especially, to get an annual physical. Get checked and don’t be afraid of the doctor – GO AND GET CHECKED. As a result of my begging (yes, begging) over 100 pastors from across the country have contacted me or emailed me or texted me and said they’re getting checkups. Praise God!!!! It Beats the Alternative (VIDEO TESTIMONY) from Robert Earl Houston on Vimeo. LANCASTER, Calif. (KABC) — Family and friends are mourning the loss of a local pastor who died following a car crash on the 14 Freeway in Acton. As relatives gather outside the home of Pastor Manard Giles, a long embrace helps absorb the shock of losing the father and grandfather they loved and admired. The 77-year-old was killed early just before 3:30 a.m. Saturday following a wrong-way crash on the northbound 14 Freeway past Escondido Canyon Road. According to the California Highway Patrol, a suspected drunk driver, later identified as Bradford Pate of Burbank, drove his Toyota Tundra south onto the northbound lanes. Pate’s truck hit Gile’s Chrysler 300 head-on and then rolled over and hit a Ford Econoline van with eight occupants. Giles was pronounced dead at the scene. He was a pastor at The Answer Community Church of God in Christ in Lancaster. His passenger, a 47-year-old Lancaster man, was airlifted to an area hospital in critical condition, the CHP said. Another passenger, an unidentified woman, was transported to a Burbank hospital with major injuries. The pastor and his two passengers were reportedly on their way back from a church event in San Diego. Three people inside the van reportedly suffered minor injuries. The crash shut down all northbound lanes of the 14 Freeway approaching Escondido Canyon Road. All lanes were reopened around 7:30 a.m.
Another driver traveling the wrong way on the 14 Freeway in Agua Dulce caused a multi-car pile-up last Monday. The CHP says drugs or alcohol were a factor in that accident as well. “Even though I forgive him, he still has to pay the price because my dad’s life can’t be brought back,” said Rosalyn Harris, Giles’ stepdaughter. Family members now look to God and each other for support, knowing the guidance they received from their father carries on. “I thank God for being God,” said Giles son’ Limmie. “God gave me a good father here on Earth as well as the one in heaven, to be a God to me, and show me the way to live. Pate remains in the hospital with major injuries. Upon his release, he will be arrested for suspicion of drunken driving causing injury. No one else was in the pickup truck. Rev. Robert Dean (R. D.) Smith was called home to be with his Lord and Savior on June 11, 2013, in Bastrop, Texas, at the age of 78. He was born to George (Boots) and Lillie Mae (Thomas) Smith on Aug. 6, 1934, in Hope, Arkansas. He attended Yerger High School and left to attend the U.S. Air Force in 1951, where he completed his GED. He was honorably discharged in 1955. He was the longtime pastor of the Mt. Rose Missionary Baptist Church, a Chaplain with the Bastrop Police Department, chairman of the local Bastrop board of the Emergency Food and Shelter Program, a retiree of the Bastrop Federal Correctional Institute, and a member of numerous boards and commissions. He is survived by: loving wife, Gwen, of 48 years; sons Robert C. of Bastrop, Rory D (Beatrice) of Elgin, David C. (Ella) of Georgetown; daughters Kim Mathis of Dallas, Tereatha Mason of Bastrop; mother Lillie Smith of Arlington; Roscoe C. Smith of Dallas, George (Judy) Smith Jr. and James (Tyrus) Smith of Cedar Hill, Texas, and Jimmy C. Smith of Hope, Ark. ; a sister, Gwendolyn Elliby, of Arlington; grandchildren, nieces, nephews, cousins and numerous other family and friends, including the Mt. 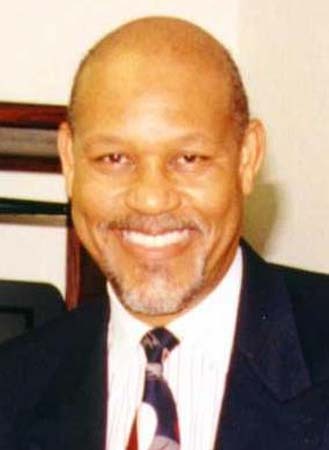 Rose Missionary Baptist Church family who will remember his teachings, his love of Isaiah 40, his wit and most of all, his love for all; and the City of Bastrop where he served as Police Chaplain and on numerous boards, commissions and committees. He is preceded in death by his father and niece Gwendolyn Rochelle Smith. A wake will be held at the Mt. Rose Missionary Baptist Church, 507 Toliver Street on Tuesday, June 18, from 6- 8 p.m. with visitation beginning at 2 pm. Funeral services will be held at the Bastrop Convention Center, 1408 Chestnut on Wednesday, June 19, at noon. Interment will follow at Fairview Cemetery in Bastrop. In lieu of flowers, donations can be made to the Bastrop County Emergency Food Pantry or the Mt. Rose Missionary Baptist Church Building Fund. This week, I severed a relationship that goes back some six years ago. After hearing about the “good news” and hearing others talk about it, I gave my time and attention to the iPhone and trusted in the vision of their “Pastor” – Steve Jobs. It’s been quite the relationship. Standing in the rain for the latest phone. I remember being in Memphis one year when an update came in and standing in oppressive heat outside to get the latest version. I remember being in Paducah and walking into an AT&T store without any problems and snatching up the latest phone. I’ve been a great disciple. I converted my wife, several of my friends, even slipped in a reference to my phone in conversations with friends, loved ones, and even people I didn’t know. I remember showing my phone to a grandfather and his grandson on a flight and watching the kid’s eyes light up as I showed him the game, “Stupid Zombies 2” and remember him shouting, “Air Drop! Air Drop!” Ahh . . . Pastor Jobs had me tuning in for his once a year or sometimes twice a year, two hour presentations . . . and of course, his “one more thing” meant something wonderful was about to be announced! But this week, I left the Church of iPhone. Rather than just to leave without explanation, I thought this might be helpful and explain to the new pastor, Tim Cook, why I left. I’ve been converted to the Galaxy Note 2, and am in the midst of new member orientation, learning all the ins and outs. First, my Pastor ain’t like my last one. Pastor Tim Cook is a decent guy, I’m sure. But he just doesn’t have the presence or vision like Pastor Steve Jobs. Pastor Tim looks like a guy trying to be cool, when Pastor Steve was cool. Pastor Tim looks like a guy who took off his coat because it’s hot, where Pastor Steve looks like a guy who woke up, threw on a turtleneck and had no intension of wearing a jacket. Not only that Pastor Tim has not captured my imagination. I gave him a change. When Pastor Steve died on October 5, 2011 – a memorial service was held and it was announced that Pastor Tim was Pastor Steve’s handpicked successor – but that was not enough. The iPhone has become boring. It’s true – it’s still one of the biggest phones out there, but the innovation has been lacking. The speed and camera is sometimes impressive, but the apps look the same today as they did two years ago. The phone is relatively small in this Phablet age. I’m 53 – I don’t need a 3″ phone, I need something I can see and relate to. My Galaxy Note 2 is fun. I’ve been on medical leave since May 30, 2013, and I’ve had time, with my leg propped up to see what the phone can and can’t do. I like the fact that my phone doesn’t have to be tethered to my computer to add an app. I like the fact that even though I’m still an Apple person, there are apps that make my Mac and Galaxy Note “talk to each other.” The Samsung folk have got it right. I know, the argument will be made that Apple is “American Made” but according to their own documents, even though their offices are in California, on paper, they are based in Ireland. Samsung is based in Japan. So they’re both non-US companies. The truth is I don’t want a phone that’s just like everyone else’s. I want a different screen. I want different apps. I want to have fun with my phone. I don’t want a Victorian device that does not allow for some personality. I don’t want to be a lemming, I want to be a sheep. I have different wool, different eyesight, different strengths, different weaknesses. I look for that in my phone. Accept me for my strengths and weaknesses, and show me that I can learn to do or be better. Hmmmm . . . I also look for that in my Church and Pastor. Why Are Our Conventions Attendance Falling? We’ve all heard the whispers and numbers don’t lie. Among the four traditional African-American Baptist denominations, namely, National Baptist Convention, U.S.A., Inc., National Baptist Convention of America, Inc. International, Progressive National Baptist Convention, Inc., and National Missionary Baptist Convention of America – attendance in both annual sessions and Congresses are falling. When I was a young minister, attending the NBCA (before the split) Convention and Congress, I was amazed at the numbers. During the annual session, President’s Day it was packed “kibber to kibber” – no matter what part of the Country, if the NBCA Convention or Congress assembled there, a large crowd was sure to attend. Even in controversy, in San Francisco in 1980, when the hotel workers were on strike and we literally had to change our own beds, the ballrooms were packed and late night service was the crown jewel of the meeting. I remember the Ministers Classes of the Congress were standing room only to hear preachers like Drs. P.S. Wilkerson, Robert H. Wilson, Sr., Nehemiah Davis, Melvin Von Wade, Michael Lee Graves, A. Charles Bowie, and others stalwarts of NBCA. But today it’s a sad, different story. 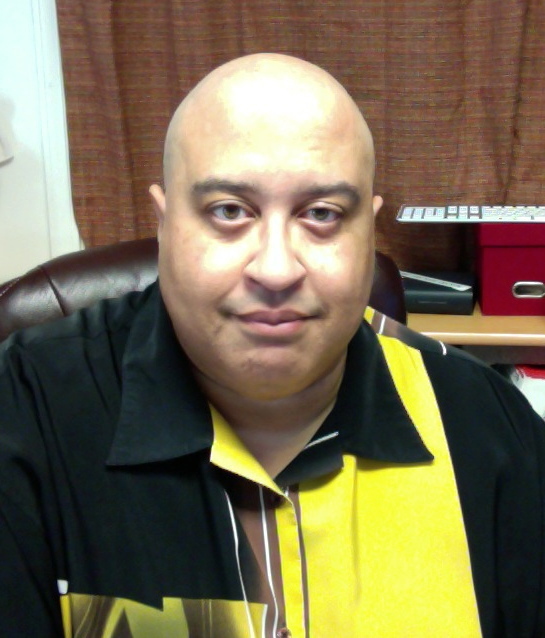 Our conventions are falling down in attendance, I think for three reasons that I want to share and then I want to share a blog by Trevin Wax, to show us that this problem is just not a black baptist problem and methinks it may be across the board in most religious conventions. Baptists are consumer friendly. We don’t mind travel – our local churches prove that. Our preachers prove that. We will take a two-hop plane to get to a revival and you won’t hear a peep of complaint. Most of our congregants don’t even attend the church in their neighborhood – they drive cross town, in traffic – or in some cases across counties or even across state lines to get to church. But for Baptist conventions there is a reality – it’s the cost of travel. I was trying to help a friend get from Portland to Louisville for the NBCA session next week. The lowest that fare has been most of the summer is $590.00, round trip per person. Add the cost of a hotel approaching $150-$175 per night, plus meals, plus transportation, plus materials – and easily this trip runs into $2,000. And they’re staying home because the travel cost has gotten so out of hand. It’s partially not the conventions’ fault – they have no control over airfares (but part of me wonders what would happen if the four conventions banded together and negotiated with the airlines for a fare structure?). However, locations can make the difference in airfares. I love Louisville, but our airport is not a main hub for any airline and is more expensive to fly in and out of – as is most of the airports across the country. The hub cities – Los Angeles, San Diego, Houston, Dallas, Atlanta, New York, Denver, Chicago, Orlando, Miami, and Baltimore – tend to have lower prices, more hotels and more flexibility in hotel costs. But my point is – the cost is getting to the convention is killing conventions. Dr. Isadore Edwards in a classic sermon once said that it shouldn’t take $2,000 to deliver a $100 registration check. I think PNBC showed us the way at our session in Orlando, Florida. When we met there recently, it was “packaged” as a great family getaway – and they came in record numbers. It was something to see – young people by the hundreds, in the spacious Marriott Resort and families were able to go to Disney properties, Universal Studios, the Holy Land Experience, and other area landmarks and frankly, it has been the best recreational convention I ever attended. Families came. Airfare was cheap because Orlando is a major tourist site. Even if you didn’t spend $99 per night at the host hotel, there were so many $40 and up hotels in the area, it promoted travel. Even members with timeshares used them to get to Orlando. My suggestion is simple – put the conventions where people want to go. They want to go to cities that are family-friendly. Taking them to some cities (I’m not going to mention which ones) that are (a) off the beaten path, (b) unable to accommodate late night dining; (c) impossible to fly in and out of; and (d) are non-seasonal, creates an empty convention. It doesn’t make sense to go to Phoenix in September and Chicago in January; It doesn’t make sense to go to Anchorage in February and Palm Springs in June; It doesn’t make sense to go to New York in January and Birmingham in September. Select cities that are seasonable and capable, family-friendly, and places that have interest and cultural interest. A strange trend has popped up in our conventions. Our reactions to the new conferences that have popped up (preaching and layperson) has been to make our conventions into conferences – when both serve two completely different purposes. The Elks, Masons, Deltas, Ques, and other conventions don’t bring in speakers from other fraternities and sororities and their numbers are just fine. But what has killed us is this false fixation that in order for the convention to do well, we’ve got to bring in “A-list speakers.” No, I contend, use the speakers you have within your convention. This is a pet peeve for me because how can you say we’re a National anything when you rarely get to hear from your fellow travelers? Back in my NBCA days we heard Pastors like Hayward Wiggins, Isadore Edwards, A.L. Bowman, O.B. Williams, G.L. Bedford, S.M. Lockridge, E. Edward Jones, Stephen John Thurston, M.L. Price, P.S. Wilkerson – and not only did they preach, THEY BROUGHT THEIR CHOIRS, they brought their members – and the session would be packed. I remember in Denver, our pastor, the late Dr. A. Bernard Devers, I, preached and our choir of about 100 voices was seated next to a choir from Dr. Isadore Edwards’ church (he was the alternate) and they had about 125 voices – there were 225 voices in the choir stand, with another 2,000 plus in the audience – AT THE AFTERNOON SESSION. The people wanted to hear one of the NBCA voices from “way out there in Portland.” Nowadays it’s hard to identify with people from your own convention, because you never hear them during the session. Also, give us some “free time” to spend with our families. Give us time to eat, to rest, to reflect, to relax, to fellowship. Don’t program us from 6 a.m. to 2 a.m. because the truth of the matter is, if you don’t give us a break, we’re going to take a break. Give us time to check out the exhibit halls. Give us time to talk to college representatives and retirement specialists. Give us some time to shake our President’s hands in the hallways like we use to have. It is a convening time for the constituency of the convention – let the conferences do their thing, and let the convention be the convention. Of course, your comments are welcomed. But read Trevin Wax’s blog below . . .
Why Did So Few Southern Baptists Show Up in Houston? One of the stories from this year’s Southern Baptist Convention was the low turn-out of messengers. Truth be told, I am much more concerned with the recent report of our declining membership and number of baptisms than I am the dwindling number of messengers showing up for a yearly business meeting. Still, I’d like to venture a few guesses about why the turn-out was so low. Not hot as in “awesome city!,” but hot as in humid. All kidding aside… No one ever points to weather when addressing Southern Baptist attendance, especially since we’ll go in significant numbers to muggy New Orleans when we’re electing a president or to stifling Orlando when debating a structural change (thank goodness for our expired boycott of Disneyworld!). Seriously, though, several times this year I asked pastors if they were going to the Convention, only to receive this response:I’d rather be anywhere than Houston in mid-June. 2. The trade-off isn’t powerful enough to devote significant time and finances. Now to the more serious reasons… I think this is the key to the declining attendance of Southern Baptist Convention over the years. A generation ago, many pastors tacked a vacation alongside the Convention proceedings. The Convention provided an excellent excuse to get away, get refreshed, enjoy time with family, and escape the doldrums of summer. Nowadays, fewer pastors see the SBC as particularly refreshing. The pastor’s conference is nice, but business meetings bring up the specter of political rancor, and that’s what a lot of pastors are trying to avoid during the quiet days of summer. Simply put, it costs a lot of time and effort to go to the SBC, and unless a pastor sees spiritual value in being there, he is likely to decline going. He is also less likely to send others from his church, which leads to a further decline in messenger numbers. What’s more, a pastor is likely to funnel their travel and training budget to other conferences they consider especially life-giving. In all likelihood, there were more Southern Baptist pastors at Catalyst than messengers at the SBC this year. Next year, there could be more Southern Baptists at Together for the Gospel than at the Convention in June. Pastors are carefully considering what conferences are most beneficial and then making their plans according. 3. Things are going smoothly, which makes people feel their presence is unnecessary. While some messengers stay away because of the possibility of a rancorous business meeting, other messengers stay away because things are so peaceful. Sure, we’ve had an ongoing discussions about Calvinism and the Cooperative Program and church planting. But none of these debates have led to divisive resolutions or polarizing elections. 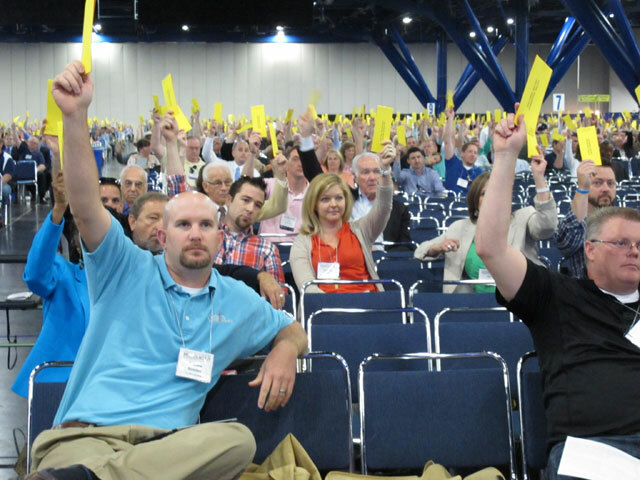 There are several types of Southern Baptists (David Dockery lists seven), but the camps are not neatly defined into voting blocs (thankfully). Plenty of pastors consider it a good sign when their monthly or quarterly business meetings are poorly attended. It’s a sign things are well. Perhaps many pastors view the Convention this way, especially when we’re not electing a president. 4. The things we are most passionate about are not the things the annual meeting tends to platform. On Monday of this year’s Convention, 3500 people attended the North American Mission Board’s “Send North America” luncheon on church planting. This is a staggering figure when you consider the fact that only 5000 messengers attended the Convention. I don’t think it’s a stretch to say that there were more messengers together for this lunch than for any of the actual business meeting proceedings. What does this tell us? Southern Baptists are hungry for a meeting that casts vision and rallies our people around a great cause (and a free lunch!). They’re not necessarily there, first and foremost, to vote on resolutions. We should continually be evaluating how we conduct our time together annually, in order to more effectively communicate our story as the Southern Baptist Convention. We have a great story to tell and my desire is for all generations to know that story. 5. Younger guys underestimate the power of institutions. My first visit to a Southern Baptist Convention was in San Antonio in 2007. I remember my initial shock at the small number of young people present. In 2013, the picture is different. More messengers dress casually than before, and there are more young pastors present than before. But overall, the pastors of my generation have to be convinced of the relevance of participating in denominational life. It’s much more attractive to branch out into nimble networks or associations that have a certain “cool factor.” Unfortunately, this emphasis is short-sighted. Recently I read Tim Keller’s Center Church, in which he discusses the interplay between movements and institutions. He points out something that is easy to ignore, that both need each other. It’s easy to see how institutions without movements quickly die (and, by “movement,” I mean that sense of shared excitement, led by charismatic leaders with a compelling vision) quickly die. What we often forget, however, is that movements without institutions lack both staying power and the teeth to accomplish their agenda. What do you think? Why are fewer pastors inclined to attend the Convention? What can we learn from other denominations or conferences? Is there still value in a denominational meeting?